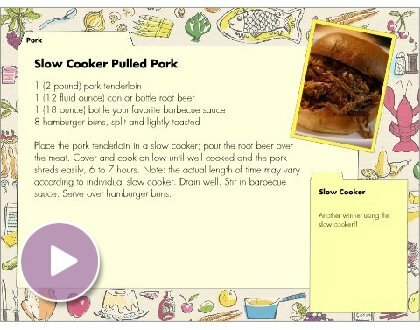 Click the “play” button to read the recipe. 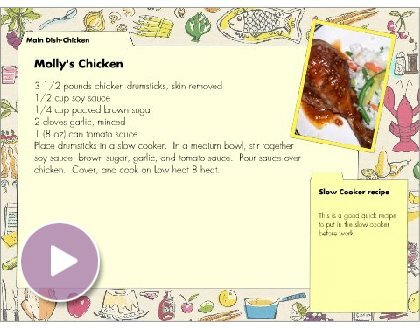 You can also print out a copy of the recipe or even save it. I love a good sandwich this time of year!! Click the “play button” to get the recipe. 🙂 Chicken drumsticks are on sale at the grocery store this week and I thought this would be a good recipe to try using the drumsticks. ( They are 79 cents a pound at United.) And this is a slow cooker recipe which makes it even easier!! Combine all ingredients except shrimp in slow cooker and stir to blend well. Cover and cook on Low 7 to 9 hours. (High 3-4 hours) During last hour turn slow cooker to High and add shrimp. Cook 1 hour or until shrimp turn pink. This is such a wonderful dish. It is great for company. Arrange dried beef on bottom of greased crockpot. Wrap each piece of boned chicken with a strip of bacon and place on top of the dried beef. Mix the soup and sour cream together; pour over chicken. Cover and cook on Low for 7-9 hours. Serve over hot buttered noodles. Sprinkle chicken with salt, pepper and paprika; brown. Put all ingredients except peas, rice and olives in cooker. Stir to mix. Cover pot and cook on Low 6-8 hours or on High 3-4 hours. Add remaining ingredients. Cook on High 1-2 hours until rice is tender. Stir occasionally. This dish is so good and easy. I can put this in the slow cooker in the morning and it is ready by the time I get home from work. The family loves it. The meat is so tender that it falls off the bone. Cut the ribs up so they fit into the slow cooker. I usually like to cut them up into 2 ribs. Salt and pepper the ribs. If you noticed I used quite a bit of pepper, that’s the way I like it. Pour on your favorite barbeque sauce. I use up all the bottles that have just a little sauce left at the bottom of the jar that didn’t get used up for one reason or another. This is a great excuse to get rid of all those extra bottles in the refrigerator. Cook the ribs on low for 8 hours. I served mine with baked beans and corn. This is one of the best recipes for stew and it is so easy!! Place meat in crockpot. Mix flour, salt and pepper, and pour over meat; stir to coat meat with flour. Add remaining ingredients and stir to mix well. Cover and cook on low for 10 to 12 hours. Stir stew before serving.